We are now able to see that from the very beginning of the Obama administration, the Republican Party has again and again demonstrated that they were completely right and Democrats were completely wrong. Whether you look at the stimulus, cap-and-trade, bogus climate change claims, health care, or terrorism, Americans now solidly agree that Republicans were represent the people; and that Democrats do NOT represent the people. Right now, a solid plurality of Americans thinks the stimulus (that 99% of Republicans voted against) harmed the economy. And the people are starting to realize what an ideological partisan slush fund the stimulus was (also predicted by Republicans). When Obama was elected, unemployment was at 6.6%. He promised that his stimulus would prevent unemployment from reaching 8%. And now it’s at 10%, and it’s going to get higher. Obama demagogued Bush’s spending. But Bush deficits -bad as they were – were only 2-3% of GDP. Obama’s deficits are 12.8% of GDP – which is five to six times higher. Now that your eyes are finally beginning to open wide and see Obama and the Democrats for who and what they truly are, let me point out a few things about the past collapse. What Americans – and particularly Americans who actually vote – need to realize is that Democrats were trying to do this kind of crap and play these kind of games all along. They were trying to do it throughout the Bush years, when George Bush tried 17 times to regulate the out of control and Fannie-Mac-and-Freddie-Mae-dominated housing mortgage markets – and Democrats thwarted him over and over again. Why do I mention the Government Supported Enterprises (GSEs) Fannie Mae and Freddie Mac? Because they were at the very heart of the mortgage meltdown. It was steps 3-5 that messed us up. Fannie and Freddie bought mortgages – including many mortgages that poor and minority homeowners couldn’t begin to afford under the mandate of the Community Reinvestment Act – bundled them such that no one could assess their risk, and then sold them to private companies such as Bear Stearns and Lehman Brothers. Fannie and Freddie were exempt from SEC [Securities and Exchange Commission] regulations. The GSEs could bundle up mortgages, which would then be rated AAA, with no requirement to make clear what was in the bundle. Private companies believed that the bundled securities were guaranteed, since they were essentially being sold by the federal government. But there were many who predicted that this system – created and maintained by Democrats – could explode. And that is precisely what happened. There was a downturn (and there will ALWAYS be downturns, won’t there? ), and Fannie and Freddie were so leveraged that they collapsed and caused the collapse of the entire industry. Financial experts anxiously pointed out that a decline of only 1.3% would bankrupt Fannie and Freddie because they were leveraged to the tune of 60%? to 78%. Democrats were the priests and acolytes of the GSE system. They protected it, and they were the ones who pressed all the buttons and pulled all the levers. Who really exploded the economy in 2008, liberals or conservatives? Who do you think? The liberal mainstream media allowed Democrats to blame George Bush simply because he was president at the time, never mentioning that the Democrats who controlled both the House and the Senate relentlessly opposed everything Bush tried to do; and it allowed Democrats to not have to account for the fact that they’d been in complete control of both the House and the Senate. But remember that the economy went from outstanding to collapsed during the two years (2006-2008) that the Congress was under Nancy Pelosi and Harry Reid. The unemployment rate was 4.4% when Republicans last ran Congress. What is it now, three years of Nancy Pelosi and Harry Reid later? Few people understand how huge Fannie and Freddie are, or how deeply burrowed they are in the mortgage industry. But let me put it to you this way: the federal government now underwrites 9 out of 10 residential mortgages. Fannie Mae and Freddie Mac went completely bankrupt, and had to be bailed out by the government. It had been Fannie and Freddie which had the sole authority to buy mortgages, bundle them into the mortgage-backed securities which ultimately exploded, and sell those securities to private companies (as I have already shown). Just as it was Fannie and Freddie which had been the seller of subprime loans. Fannie Mae and Freddie Mac, which buy and resell mortgages, have used $112 billion — including $15 billion for Fannie in November — of a total $400 billion pledge from the Treasury. Now, according to people close to the talks, officials are discussing the possibility of increasing that commitment, possibly to $400 billion for each company, by year-end, after which the Treasury would need Congressional approval to extend it. Company and government officials declined to comment. The Obama administration’s decision to cover an unlimited amount of losses at the mortgage-finance giants Fannie MaeFreddie Mac over the next three years and stirred controversy over the holiday. A Newsbuster article, entitled, “Relief Without Limits,” provides an excellent resource of facts and commentary on this incredible and terrifying development. Remember the righteous outrage of Democrats and the Obama administration over the compensation of CEOs of private banks? The Democrats don’t seem to mind when Fannie and Freddie execs get huge compensation packages. The monster rises yet again, and larger and uglier and more dangerous than it has ever been before. And just like the first time it collapsed, Democrats are in total control of it. Fannie and Freddie stock went up significantly as the news was announced. Watch it dwindle back to zero by the end of 2010. We’re facing another tsunami of foreclosures in 2010. And three mortgages get worse for every single one that improves. Just how badly is President Obama’s $75 billion foreclosure program working out? Consider these newly-released numbers: Out of every 100 homeowners who came to JPMorgan Chase for help under the program, just 15 have or will likely receive a permanent payment reduction. 1 borrower will not or is not likely to get their payment lowered. The data comes from the prepared remarks bank officials plan to make Tuesday before the House Financial Services Committee. The testimony was posted Monday on the committee’s website. It adds up to a brutal illustration of just how the HAMP program, which is supposed to reduce troubled homeowners’ monthly payments to 31 percent of their income, is failing. Failing. As in “failing grade.” As in failed Obama presidency. You still don’t know the half of it. Obama’s $75 billion mortgage modification bailout is costing taxpayers an average of $870,967 PER HOUSE when the average house is worth only $177,900. Under the radar, and against the objections of Republicans that was primarily covered only by C-SPAN, Democrats implemented and then fiercely protected policies that were almost guaranteed to doom our economy. When the meltdown finally occurred, the same Democrats who created the black hole in the first place flooded the airwaves and blamed George Bush – whom they had already vilified and brought down through unrelenting attacks using the Iraq War as their main foil. The propaganda worked, and Barack Hussein Obama – a politician who is more beholden to corrupt and frankly un-American entities like Fannie Mae and Freddie Mac, ACORN, and the SEIU than any president in history. And now we’re truly paying for our stupidity. Obama is taking the same policies that imploded our economy, and multiplied them by a factor of ten. It’s only a matter of time before his policies create a rotten floor for our economy to plunge through all over again — only this time far, far worse than before. First of all, they really aren’t getting better, and the Dow can drop a lot faster than it can rise (history lesson: there were several rises and crashes of the stock market during the Great Depression). And second of all, if you loan me a few billion dollars to spread around, I can temporarily bring up the production of my local economy, too. Just don’t expect either me or Barack Hussein to repay the loan when it comes due. Obama has been compared – and has compared himself – to FDR. We now know that for all of FDR’s popularity, his “reforms” during the Great Depression were massive failures which actually kept the United States in depression for seven years longer than if he’d done nothing at all. In believing the propaganda and lies of the Democrats and Barack Obama, Americans may have well placed the nation in a hole that it very may well not be able to climb out of. For what it’s worth, the $787 billion stimulus which Americans are increasingly agreeing was a dismal failure was in reality a $3.27 trillion porkulus package. Which is to say, this was a FAR bigger and a FAR more dangerous waste of money which will do FAR more harm to our economic futures than most Americans understand. The underlying reason for skepticism about the stimulus plan is that 50% of voters believe increasing government spending is bad for the economy. Just 28% believe that increased government spending helps the economy. Men, by a 42% to 27% margin, believe the stimulus effort has hurt the economy. Women are evenly divided. 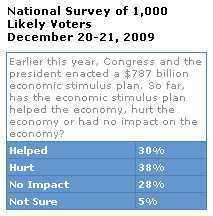 Fifty-one percent (51%) of Democrats believe the stimulus plan has helped the economy while 47% of Republicans believe it has hurt. Among those not affiliated with either major political party, 52% believe the stimulus plan has had a negative impact. Concerns about federal budget deficits also play a role in evaluating the stimulus spending. Voters continue to think that the president’s top budget priority should be cutting the federal deficit in half by the end of his first term in office. But they see it as the goal the president is least likely to achieve. Health care reform is second on the list of priorities for voters, but most oppose the health care plan working its way through Congress. Not surprisingly, most Americans are opposed to a second stimulus plan. In fact, 51% of voters say more jobs would be created if the remaining ending planned in the first stimulus plan was cancelled right away. Only 14% of American workers say their firms are hiring and 29% say their employers are laying people off. As a result, 67% expect that unemployment will be at 10% or higher a year from now. A new analysis of the $157 billion distributed by the American Reinvestment and Recovery act, popularly known as the stimulus bill, shows that the funds were distributed without regard for what states were most in need of jobs. The Mercatus Center at George Mason University in Virginia is one of the nation’s most respected economic and regulatory think tanks and has a Nobel prize-winning economist on staff. The econometric analysis was done using data provided by Recovery.gov — the government website devoted to tracking the stimulus data — as well as a host of other government databases. Additionally, Mercatus found that stimulus funds were not disbursed geographically with any special regard for low-income Americans. “We find no correlation between economic indicators and stimulus funding. Preliminary results find no statistically significant effect of unemployment, median income or mean income on stimulus funds allocation,” said the report. “We found that there is a correlation [relating to the partisanship of congressional districts],” de Rugy said. Her regression analysis found that stimulus funds are expected to decrease by 24.19 percent if a district is represented by a Republican. The analysis found that neither congressional leadership positions of local members nor presidential preference in 2008 were factors in stimulus allocation by congressional district. Finally, the Mercatus analysis shows that a majority of the funds allocated went to public rather than private entities — nearly $88 billion to $69 billion. While some of the money given to public entities may eventually filter down to the private sector, it’s much less transparent how money given to public entities is spurring economic growth and job creation. So, to repeat, the stimulus money isn’t being given out to low-income Americans or struggling geographic regions. It is being given out to Democrats to use as political slush funds. The Democrat Party is the party of corruption, partisanship, socialism, and big-government-as-God-substitute ideology. And more and more Americans are coming to realize how dangerous they are to the American way of life. Another way to look at this is that – from the very beginning of the Obama administration – the Republican Party has demonstrated that they were completely right and Democrats were completely wrong. Whether you look at the stimulus, cap-and-trade, garbage climate change claims, health care, or terrorism, Americans now solidly agree that Republicans were right; Democrats were wrong. This is from the Liberal Angle Times, a.ka. the Los Angeles Times. Hence, one needs to have a constant angle-straightener as one reads. The Obama administration’s new plan to give a boost to small businesses reflects continued trouble in that sector, which is facing new failures even as much of the nation’s economy is stabilizing. [If you want to tak about a new failure, talk about Barack Obama, then everything else pretty much falls into place. The problem with the “much of the economy is stabilizing” thesis is that 3/4ths of all jobs in this country come from small businesses, which are obviously getting hammered. The liberal rationale that we are recovering is part of the reason that we will have a double-dip recession and a jobless recovery. You can’t fix a problem if you don’t first acknowledge you genuinely have one]. As credit lines have shrunk and consumers have cut back on spending, thousands of small businesses have closed their doors over the last year. The plight of struggling firms has been aggravated by the reluctance of banks to lend money, said Brian Headd, an economist at the Small Business Administration’s office of advocacy. [Obama demonizes banks even as he claims they have a responsibility. Well, which is it? Are they demons selfishly doing their own thing, or are they legitimate and important institutions that have performed an important role in society? Furthermore, banks say they aren’t lending because Obama has tightened up on them way too much, such that they CAN’T lend. Bottom line: Obama – through demonizing and regulating – has done nothing but make a bad situation far worse]. “While bankruptcies are up, overall, small-business closures are up even more,” Headd said. [Small businesses have been crying out in agony about everything Obama has done. ObamaCare will punish them; raising taxes “on the rich” will punish them; cap-and-trade and various other energy taxes and measures will punish them; card check will punish them; hiking up the inheritance tax in 2011 will punish them. Obama has done nothing to help these businesses and everything to hurt them. And then we wonder why they’re going extinct]. California has been particularly hard hit. The latest data show small-business bankruptcies up 81% in the state for the 12 months ended Sept. 30, compared with the previous year. Filings nationwide were up 44%, according to the credit analysis firm Equifax Inc. [We were told last year by Obama that this was the worst economy since the Great Depression. And now small businesses bankruptcies have nearly DOUBLED under his management? If we were facing the Great Depression last year when small business bankruptcies were up 44%, what are we facing now, when they are 81%]. The actual number of small businesses in trouble is probably higher, experts said, because many owners file for personal bankruptcy rather than seek protection for the business. [Well, that’s just great. The actual numbers are even worse than twice as bad as they were last year. Sounds to me like the economy must be doing fine]. Dennis McGoldrick, a bankruptcy lawyer in Torrance, said his clients are all stuck in similar situations — capital is hard to come by, customers are tough to attract and debt is piling up. [Clearly, Obama’s first full year in office has been a rousing success. But least these small businesses owners are becoming more like the federal government, with massive debt piling up. It’s good to be more like the wonderful and marvelous Barack Obama, isn’t it?]. “We can’t keep up,” McGoldrick said. “There’s more people that want to come in every day than I can see.” [Bankruptcy lawyers: jobs Obama has “created or saved.”]. Cecily McAlpine, who filed for bankruptcy protection for her Cold Stone Creamery franchise this spring, said the experience was humiliating but she had no choice. [Plan to come back in 2012, Cecily. Someone who isn’t just a clueless community organizer, and who has an actual idea how a functioning economy works, will be president then]. Receipts at the fledgling Compton ice cream shop plunged dramatically during the recession, and by late 2008 she was paying her employees out of her pocket. McAlpine recently withdrew her bankruptcy filing after selling all the store equipment and paying off her creditors. She is slowly paying off some back-rent and utility debt, and will officially dissolve her business in the next couple of weeks, she said. “I still feel scarred and like a loser,” she said. “Even though I’m not in it anymore, it’s still there.” [Yes, but the liquidation companies have jobs that Obama “created or saved.” And that’s the important thing]. Recognizing the problems of business owners like McAlpine, the Obama administration has proposed using federal stimulus money to help funnel more loans to small businesses. The White House has also asked Congress to eliminate capital gains taxes for one year on new investments in small-business stock, and called for a new tax incentive to encourage small businesses to hire more employees. [I don’t know if Obama recognizes the problem or not. What I do know is that funneling more money to the federal government in the form of the Small Business Administration is far from a solution to the problem. Most small businesses avoid the SBA like a plague, due the political correctness, red tape, byzantine regulations, and DMV atmosphere of the place]. On Dec. 14, Obama called a meeting of executives of Wells Fargo & Co., Citigroup Inc., Bank of America Corp. and nine other large banks, and told them that they owed it to the nation to make more loans to small businesses and help rebuild the economy. [Obama owes it to the nation to resign and allow the economy to recover by itself. Aside from that, a) calling in executives to stand hat-in-hand while Obama partly demonizes and partly lectures them is not going to solve anything, particularly when b) it’s the small community banks that do most of the loaning to small business]. In California, the need is great. [But the other 49 states are doing just dandy]. Over the last year, the Los Angeles, Riverside/San Bernardino and Sacramento metropolitan areas have led the nation in small-business bankruptcy filings, said Tim Klein, a spokesman for Equifax. [And what’s really scary about that is that California generally leads the nation as the trendsetter. And this isn’t a very good trend, is it?]. About 19,000 small businesses filed for bankruptcy in California during the 12 months ended Sept. 2009, up from 10,500 the previous year. [Like I said, pretty much double under Obama. I remember Obama promising that unemployment wouldn’t go over 8% if we passed his stimulus that had all these “shovel ready projects.” But that’s done and gone; now I’m ready to buy Obama’s next lie]. During September alone, 2,229 small businesses filed for protection, up from 1,503 filings in September 2008, the firm reported. [Well, that’s good. At least the trend is getting worse. You can look at the upward sloping bankruptcy graph and convince yourself that it means progress. Or maybe you can look at it and pretend you’re a mountain climber]. Kathleen March, a bankruptcy lawyer in Los Angeles, said she often pushes her clients to file for personal bankruptcy instead of a business filing because it’s easier. [Oh, yeah. I’d forgot that earlier part about, “The actual number of small businesses in trouble is probably higher, experts said, because many owners file for personal bankruptcy rather than seek protection for the business.” Scratch that part about “pretty much double.” It’s actually far worse than “pretty much double,” but we just don’t know how much worse it actually is. Many people also close down their businesses thinking that will solve their problems, only to find their companies’ debt lives on, March said. [Obamanomics: the gift that keeps on giving and giving]. “The norm is if you’re running a small business, you will have to either cosign or personally guarantee the significant debts,” she said. “The business itself can shut down, but the people cosigned all the debts. So, the individuals are then saddled with these huge debts.” [Yes, but loan collectors count as jobs that have been “saved or created.”]. A client who owned a surf shop was paying for business expenses from the client’s own funds long before filing for personal bankruptcy, she said. “In this economy, anything that isn’t a necessity is a tough business to be in,” March said. “And the majority of my clients have waited too long to file for bankruptcy and in the process made things worse on themselves financially as a result.” [Well, that’s just great, because we can count on a whole lot more small businesses going belly up as all those other clients who’ve waited start floating with their bellies up. That’s change you can believe in]. What these business owners really need is a nice sharp tax increase to make them even more profitable. There. If the LA Times article comes preset with a sharp leftward angle, a good hard pull to the right ought to straighten it out. Like most people, a great deal of what I receive in my email is junk. But every now and then there’s that nugget of gold. If a black or Hispanic are conservative, they see themselves as independently successful. I suppose this world, the things in it, and the treatment we receive in it, are all that matters to liberals because they have nothing beyond big government and their own egos to place their hopes in. Some ill-informed persons out there actually had the temerity to accuse Democrats as the “tax and spend” party. A stereotype! Whatever could have given them that idea? Perhaps this: Democrats will—on Christmas eve, in a festive display of mono-partisanism—vote to raise taxes and increase the national debt limit. The old limit couldn’t properly account for their prodigious profligacy, you understand. The government is bleeding money: it’s gushing from every bureaucratic orifice. Solution? Spend more! That is, you will be forced by implied gunpoint to fork over your money to a private company. What else can you call a party that literally raises taxes and increases the debt limit on the very same day anything other than the “tax and spend” party? These Democrats are so intellectually vacuous and morally insane that they continue to pretend to pay lip service to “fiscal responsibility” even as they spend more money more quickly than any human civilization that has ever occupied planet Earth. And for the record, the government using its power of regulation and naked force to control private businesses, and then make sweetheart deals with the same businesses that they control, is naked fascism. You are currently browsing the Start Thinking Right blog archives for December, 2009.